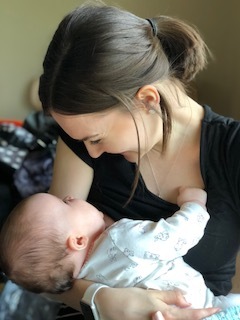 Now that Edith is 6 months, I thought I would write a post about my first 6 months as a mum, everything that Edith has learnt and just a general update. Part of me wishes that I've started these sooner, but I figured half a year old would be a good place to start. It's such a whirlwind when you become a parent, especially for the first time. A lot of the time, days blur into one, but there is nothing quite like experiencing your child's 'firsts'. Newborn days are tough. For me, it's when I learnt the most. Of course, I'm learning everyday with Edith, but those first few days are just spent getting to know this new tiny, dependent person and trying to figure out your own rhythm. When Edith was born, there were so many things that I was looking forward to. When would she smile? When would she laugh? I just couldn't wait. I remember sitting in hospital, and I got ahead of myself, like I quite often do, and my heart just felt so full. So far Edith has smiled (6 weeks), laughed (12 weeks), rolled over from tummy to back (4 months), sat up independently without support (5 months) and stands with support (5.5 months). Of course, she does other things as well such as her high pitched squeals when she is excited, or her cheeky grins when something is not quite funny enough for a laugh. Edith's first laugh is what really sticks in my memory. We were on our first family holiday, at Center Parcs, and I had just unpacked all of our things and was sorting out our swimming bag. I was so excited to take Edith swimming for the first time (12 weeks), and really hoped that she would like it. So, I was a bag of excitement which must have rubbed off on Edith. 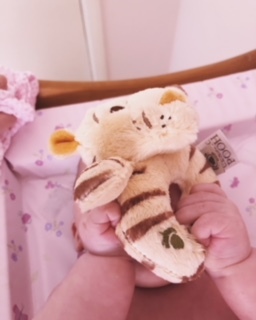 She was in Max's arms and then this beautiful giggle just came out. I cried. Max laughed at me crying, and then we all ended up laughing. It was just one of those lovely, but cheesy, moments. Not spitting out food when it is in their mouth (to do with the gag reflex). As Edith was doing all of these things, we began to experiment with some foods. So far, she has tried broccoli, potato, carrot, baby rice, toast, baked beans, banana, and just about a lick of anything that I'm eating. I started by trying her with a spoon, but she was not so keen and so we just leave her with foods on her tray. Although she is able to pick things up, she chooses to just put her mouth directly to the tray to eat...lovely! So, we had our first family holiday, which you can read about here, when Edith was 12 weeks old. We had the best time, which makes me so excited for her first time at Disneyland Paris, and our return to Center Parcs next year! We took Edith Swimming for the first time at 12 weeks, which she wasn't overly impressed about, because the water was much cooler than she was used to. Edith and I tackled our first play group, which you can read about here. Edith loved it. There was a perfect mix of sensory and fun activities. 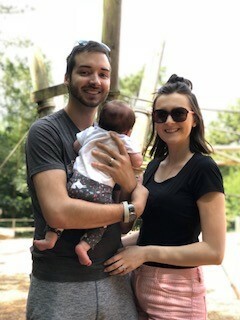 We also took Edith for her first trip to the zoo, again, you can read about that here. I think it's safe to say that Mummy and Daddy had more fun than Edith did! Edith is her own person, and so has a few of her favourite things, regardless of how much I want her to like certain things! Edith has always enjoyed being on her play mat but as she is getting bigger, she is more reluctant to being on her back, on the floor. After much thought, she was bought an activity centre, which she loves. It has so many different toys on there that she enjoys being able to twist around and play with them all. Now that she is older, Edie particularly enjoys her toy eggs. I'm sure most children have a set of these, or at least they did in my family, and she absolutely loves them. 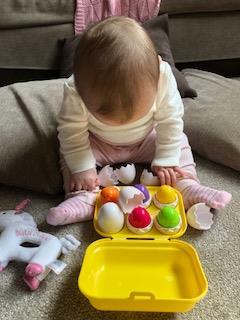 Along with those, she has a whole load of rattles and teething toys that she's fond of, but the eggs are by far her favourite. She's not so keen when I try and organise them! As for me, I've learnt so much since becoming a mum. The biggest thing being to trust my gut. Parenting comes with all sorts of decisions that need to be made, and ultimately, it just comes down to instinct. Another big thing is not having a routine. Of course, we have some structure to our day, but it's not set in stone. Edith's bedtime is pretty consistent, but there are times when it just doesn't go to plan. There are times when nap time, during the day, doesn't go to plan, or she'll just miss her naps completely. We don't have certain feeding times and I don't have a set bathing routine. That's ok. I let Edith lead me. I pick up on her cues and go with it. Isn't that what parenthood is all about, winging it? You often get asked in life whether you would change anything in your life, and I guess parenting is no exception to that. As cliché as it sounds, I am blown away everyday with the miracle in our lives, that is Edith. So, would I change anything about the last 6 months? Absolutely not. Have they been perfect, every single day? Absolutely not, but for the most part they have. I love being a mum. I love watching Edith grow. I love watching Max be Daddy to Edith. If the next 6 months are as beautiful as these past ones have been, then we are on to a winner. How was the first 6 months of your parenting journey? Have you got a favourite memory?